COTW: Man Knocks Out Woman: Self-defense? This week’s Case of the Week involves a video that has been making the rounds of the internet the last day or two showing a large white man apparently knocking out a smaller young black woman with a single punch. I’ve seen reports that the man has been arrested, and presume that he will attempt to justify his punch as a lawful use of defensive force. The video is too abbreviated to allow for a comprehensive analysis of the likely lawfulness of the man’s punch, but in this Case of the Week we can at least touch upon the relevant issues that will be key to any such analysis. The general scenario portrayed by the video appears to be a large white male surrounded by a group of angry shouting black women. I can’t decipher any specific words, but the women have collectively surrounded the man and are yelling at him for reasons unknown. The man is turning around and looking at the various black women surrounding him, his arms at his sides. Eventually one of the women commits a simple battery upon the man by shoving him forcefully in the back. When the man turns to look in the woman’s direction in response to the shove she aggressively closes proximity on him with a hand raised towards his face. The man responds to this aggressive approach, in the immediate aftermath of the simple battery committed against him presumably by this woman but certainly by the mob, by shoving the woman away from him—he does not close distance towards her but merely stands in place. In response to the man’s shove the woman charges the man with her hands raised in a fighting position, apparently drawing her right fist back in preparation to throw a punch at the man. Before she can do so, however, she runs into the man’s left hook, which drops her to the ground. The man attempts no further physical force after that point. At no point did the man advance towards the woman. It is noteworthy that the video begins with the frame focused on a white woman and child. It is unstated if these two people have any relationship to the man, but if so we would need to consider defense of others as well as self-defense in this analysis. It is also important to note that the man is dealing not just with a single aggressor in the form of the woman who initially commits the simple battery against him, and then continues her aggression towards him, but rather a mob of women acting in concert. Each member of a mob is responsible for the unlawful conduct of the mob as a whole. As with all use-of-force legal analysis, the touchstone is the five elements of self-defense: innocence, imminence, proportionality, avoidance, and reasonableness. 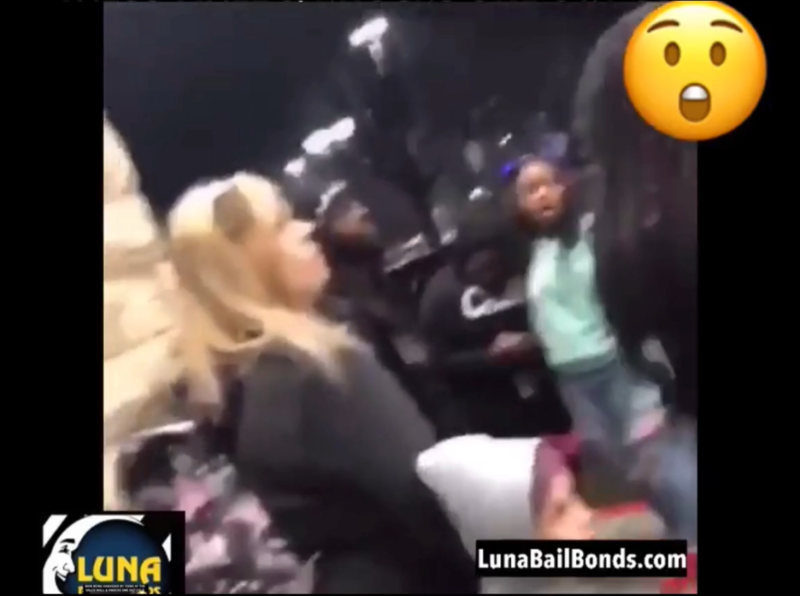 With respect to the first element of innocence, we can’t tell from the video what led to this confrontation, but the first act of physical violence we observe is the simple battery committed (apparently) by the black woman who would end up knocked down—that is, her forceful shove of the man from behind. She follows this shove by then aggressively closing on the man with her right hand raised towards his face. At no point does the man attempt to approach the woman. Rather it is consistently the woman who approaches the man. Having just been shoved for no apparent lawful reason, this aggressive conduct by the black woman would be sufficient to give the man a reasonable expectation that she intended to use additional unlawful force against him. He is, of course, generally entitled to use defensive force to defend himself against unlawful force directed towards him, subject to the other elements of self-defense. With respect to the second element of imminence, each time the black woman closes aggressively on the man, especially after having already committed a simple battery against him, there would be reasonable grounds for the man to perceive an imminent threat of further unlawful force against him. That said, an argument could be made that the considerable disparity of size and likely also strength between the man and the woman was sufficient to make his thrown punch disproportionate and excessive relative to the woman’s apparently intended punch. A counter-argument would be that the man was facing not just the single woman attacker, but a collective mob of which the woman attacker was only one member. It is noteworthy that the man immediately ceased using force against the attacking woman once her threat against him was neutralized. With respect to the element of avoidance, I do not know whether these events take place in a stand-your-ground or a duty-to-retreat jurisdiction. Even if these events took place in one of the few duty-to-retreat states, however, most of those impose that duty to retreat only before deadly defensive force can be been used. Here no deadly defensive force was used. In addition, even the few duty-to-retreat states impose that duty only where retreat can be accomplished with complete safety. Completely safe retreat from a surrounding mob would seem unlikely. With respect to the element of reasonableness, in a general sense, much will hinge on the circumstances that led up to this confrontation, and those are not captured in the video clip. Based on what is visible in the video, however, it would appear that the man had a reasonable expectation of being subject to additional imminent attack by the woman. Overall, it would seem the man has a reasonably robust claim of justification for his punch knocking down the woman attacking him, and any prosecution would be tasked with disproving that claim of self-defense beyond a reasonable doubt Note that this does not mean he can’t be arrested and prosecuted, nor that the state cannot use the criminal justice system to cause him tremendous financial destruction, nor that the media won’t collectively and forever brand him as a racist misogynist. I don’t know whether this man had a reasonable opportunity to avoid finding himself in a situation in which he ultimately felt compelled to punch a young black woman in the face and knock her to the ground, but clearly if he did have such an opportunity it would have been prudent of him to take advantage of it rather than subject himself to the vagaries of the justice system and the life-destroying hate-fest of the media. I read half of the dissertation and AGREE TOTALLY. !!! SELF DEFENSE. ALSO, I’LL bet those howling hyenas will not soon attack someone else.